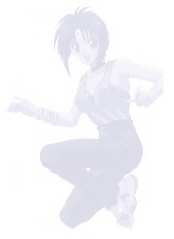 The information contained herein is provided by the DREAM WORLD'S FLAME OF RECCA SHRINE owned by Fukko. It is based on the manga. During the time of the warring states, Oda Nobunaga united Japan committing many evils in the process...... such as killing his own brother, burning hiei mountain, killing innocents in his pointless war...... then...... the fourth year of tensho! he faced the 53 ninja clans led by Iga! in that battle, the nameless hokage were also there! unfortunately-- nobunaga over powered them with his huge army! the hokage clan seized to exist afterwards...... the modern day theory was that nobunaga hated ninjas, he was afraid that they might oppose him one day...... but, that’s not the truth! oda nobunaga’s only fear is the hokage ninja! because the hokage owns the strongest weapons this world has ever seen! they are the hokage madougu! they are created from magic, science, natural elements, only the hokage ninja can make the madougu, this is the only thing oda feared! after the hokage were wiped out, the madougus were lost all over the world...... deep in the mountains, sunk under the ocean...... no one has used them again. The acquisition of the different madougu was the supposed objective of the Urabutosatsoujin (until of course Mori Kouran's true plan was revealed). The losing team would surrender to the victor the madougu they possessed. This was not the case however, as mostly the madougu were destroyed along with the one owning it. Back to the Hokage Clan, there were two outstanding makers of madougu and each of them would try to outdo the other. They are Kokuu (the good madougu maker, and Recca's seventh dragon) and Kaima (the evil madougu maker, creator of "Heaven and Hell" aka Tendou Jigoku). They competed against each other for many years and as a result they have created a load of madougus, mostly in pairs. One of the makers said that madougu should be used to protect and save people. The other maker believes the madougu must be used to attack and destroy enemies. It comes out as one madougu being good, and it's counterpart (the other pair) is evil. The wind is gathered to form tornadoes that may be used as defense. It may also be used to create air currents for attacking. This simple power of the fuujin was overwhelming enough to nearly blow Recca off the water. It can even lift Fuuko to great heights and increase her speed. When combined with the Oni no tsume, it increases the power of the latter and it can tear into almost anything. The fuujin can draw all the air in the surround at an instant and create a vacuum, which makes wounds equal to a blade. with a strong force, it could tear the opponent into pieces, or it could cause increasing pressure on the opponent. other than that, it can also gather airflow and form a tornado. Kaze means wind. This power is possessed by one of the small beads of the Fuujin. The small bead turns into a cute furry animal that looks like a mouse. It is called the kaze no kadama. It can destroy a spider the size of a giant in an instant. It was introduced in the episode where Fuuko battled Gashakura. It curls into a ball, and Fuuko throws it. It rotates at an amazing speed so when it hits you, it has a massive impact. Kinda like getting hit by a fastball. She also used this fighting Mikoto. The spirit of wind choses its master, like Recca's flame dragons. Small but terrible, huh? Ooh, that's the cute thing up there with Fuuko. Let's see...a little bit of addition here. Oni no Tsume + Fuujin =Kaze no Tsume. Kaze no tsume is Fuuko's innovation of the fuujin. Since her madougu had lost its' original eye stone, She inserted the oni no tsume to take its place. It works as flying clwas. Kzae no tsume means "Wind Claw." She used this to stab that *evil* Fujimaru. Some more arithmetic for you. Fuujin - Kazetsume =Hikuu? It is said that when Kazetsume is detached from Fuujin, it is called HIkuu. It takes the form of flying claws that can attack the enemy from any direction. Hikuu takes orders from Fuuko telepathically. Fuujin and Hikuu work hand in hand. Fuujin provides the wind current to carry Hikuu through the air. Okay, to quote my History teacher in high school, Mrs. Genuino, "I stand corrected." It's RAIJIN, not reishin as I originally wrote it. It should've made sense to me earlier. Fuuko=fuujin, Raiha=raijin. This is not Fuuko's weapon, but rather Raiha's weapon. Now what the heck does this have to do with Fuuko-sama? Do you remember how it was said that madougu are made by pair, and that a good madougu has an equivalent evil madougu? Raiha had once told Fuuko that their weapons are complimentary, i.e., it's the other half of the pair. The God of Wind vs The God of Thunder. Raijin had a brief appearance in volume 17 when Anzai-sensei stuffed it amongst a sketch of madougus. Raiha never used it at least until volume 16 to save Tsukino Mori (Kurei's adoptive mother and Mori Kouran's wife), and in volume 27 to save Fuuko from attacking robots. The raijin looks like an evil fuujin, or a scropion. It also has a spirit like the fuujin but its uglier and bigger. Its tail is used to stab unto the arm of the wearer and drains its blood. The raijin draws its power from the one who possesses the weapon. Raijin means God Of Thunder. These are *NOT* madugous. Kunai are those smile knives (known in the English dub as gimlets) Fuuko used to first face Recca atop the school roof when she first met and confronted Yanagi and during the that they invaded Mori Kouran's mansion. These are pretty common anime weaponry, as you also see these being wielded by Misao of Rurouni Kenshin. WHERE IS THE CENTRAL STONE OF THE FUUJIN? HERE IS YOUR ANSWER. SPOILER FOR VOLUME 23!!! READ AT YOUR OWN RISK! Fuuko starts off playing video game with Ganko and losing pathetically... and then she takes her out to the park to play. While Ganko is all happy, Fuuko wonders what she's gonna do with her fuujin completely powerless, now that all the small crystals are gone. They walk around and she's is stopped by a mysterious old fortuneteller. He gives Ganko all good fortunes but shocks Fuuko by saying that he can see death in her future. He asks her to pick a fortune note... (not the forutne cookie ones... the ones like in a temple...) and Fuuko has to read it when she gets home. Of couse Fuuko falls head over and then totally slaps him around for tricking her in one of those really funny pictures... (my poor Raiha-kun... T.T) but to her surprise, Raiha is very serious this time. He points a sword in her face and says that the death that he foresaw was true. She really is too weak right now. So they start fighting, while Fuuko is totally pissed off that Raiha said that she has a death look... Raiha dodges all her attacks easily and while he's internally praying that Fuuko, please get stronger... in these three days, he will make her learn the real meaning of the will to have strength. So one day passes, two days passes, on the third day... look at the poor forest that's all wrecked... Fuuko almost got no sleep, she begins to think about all the different faces of Raiha ever since she first met him... and then the key was to feel that presence... Raiha suddenly attacks her, but she was actually ready because she sensed it and catches him off guard. So in one second she actually has him cornered and points the big spear in his face. His goofy smile comes back and says congratulations to her. As they are about to leave the forest, he says that he has sharpened all of her senses and nerves in three days and that finally he has something for her, a present, I guess.